The debate in the field of Corporate Social Responsibility (CSR) in achieving Sustainable Competitive Advantage (SCA) was ongoing from the beginning of the twenty first century. The role of stakeholders and CSR in achieving sustainable business has increased in recent years. The purpose of this qualitative study was to achieve deeper understanding about the CSR initiative that may contribute to achieve SCA for the company. 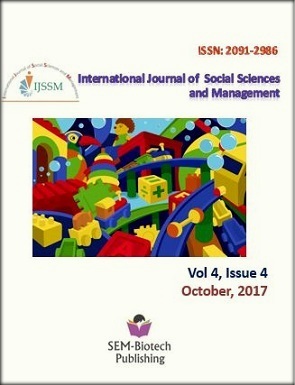 A single case study with three unit of analysis was used to achieve a deeper understanding on how CSR in planned, aligned and implemented in the noodle companies in Nepal and how those initiative may contribute to the company in the form of SCA and to community in the form of societal development. The stakeholder theory was used as theoretical framework with semi structured interview as data collection method. For the data collection purpose, two groups of stakeholders were interviewed. The first group was internal stakeholders including managerial level employees and second group consisted of external stakeholders including suppliers, customers, local community members and environmental activist. The findings of the study clearly indicated that, the strategic approach to CSR contributes to company in the form of SCA and helps in fulfilling the expectations of the local communities. The findings indicated that, stakeholder management is a key tool in today’s business environment and strategic CSR initiatives contributes in sustainable business and mutual cooperation between company and stakeholders.